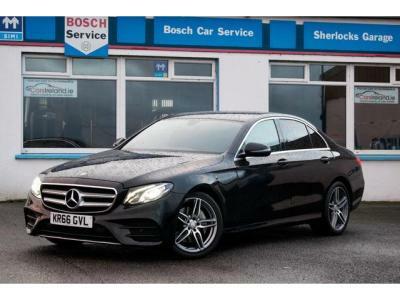 Top specification 2016 (161) Mercedes E220 CDi Bluetec AMG Night Edition in Obsidian Black Metallic with only 27,000 Miles. Immaculate condition inside & out. Stunning car in Night Edition specification. One owner from new. Full Mercedes Benz Service History. Two Keys available. Low road tax of €270 per year. AMG Night Edition with huge specification including: 18" Alloy Wheels 7 Speed Automatic Gearbox LED Matrix Headlights With Auto Dipping & Cornering Lights LED Tail-lights Gloss Black Exterior Trims Interior Ambient Lighting (Colour & Brightness adjustable) Black Leather Interior Electric Seat Adjustment Heated Seats Climate Control Cruise Control & Speed limiter Satellite Navigation CD Player & Media System (SD Card Etc) Bluetooth Connectivity & Audio Streaming Front & Rear & Corner Parking Sensors Self Parking System (Mercedes Park Assist) Car is supplied with a 12 Month warranty. Nationwide Delivery Available.